I just spelled Google. What is the meaning of "Google"? Mmm... I have no idea, but I know you need it. There are many popular search engines available, but shall we start with Google first? I know, you wouldn't mind. First thing is first. Let's me take you through a video explaining how Google search works. You may ask "What?! How it gonna help me out?". Just be patient and you gonna get familiar with Google search. Did you enjoy it? Alright... Now go to google.com and enter following query in the search bar and hit search. Ohw wait, replace mayura4ever.com by your domain name. If Google already knows about your site, you will see search results originated from your blog or website. AHA... Google has eyes on you and index your web pages with no invitation. Don't see any search results from your site? Don't worry, we gonna say Hi to Google in few minutes. Google offers a way for webmasters to see how well their sites doing on Google Search ~ Google Webmaster Tools. Do you think Google is smart enough to know all about your site? Not always. Webmaster tools allows you to monitor status of sites and let you specify how your sites need to be treated or understood by Google search. You can see if Google has problems when crawling pages on your site and make sure it's Google friendly. Why not, it also checks your site for security threats and offer search related data too. Mmm... I won't take you through all the details about webmaster tools. Not today. 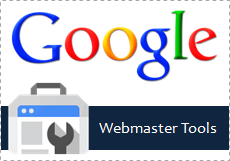 Proceed with below steps and list your blogs and websites in Google Webmaster Tools. Go through available search related data, tools and services for your sites and see how you can make use of them. Sooner we will be talking about how you can manage your blog or website in Google Webmaster Tools with available tools and services. Today, it's about the INITIATION. Shall we? * You need to have a Google account, in order to sign in to Google Webmaster Tools. If you don't have one, create a new Google account. * If you are a Blogger user, you don't need to follow steps below. Just sign in to Google Webmaster Tools using the Google account you used to sign in to Blogger and your blog will be verified automatically and listed there. 1. Go to Google Webmaster Tools website. 2. Now click Add a Site button. 3. Enter your blog or website URL in the given text field. 5. Now it's time to verify your blog or website before starting to manage. You can upload a HTML file to your site to verify it by following the given instructions. But if you are uncomfortable with uploading files to your site, you can switch to Alternate methods and use one of options available there. The easiest way is HTML tag option as you need to insert a HTML meta tag to your blog or website just before </head> tag. 6. Once you successfully verified your site, you can start managing settings and monitoring how your site doing on Google search. Note: You won't see data for your sites just after adding your blog or website to webmaster tools. It may take few days to populate relevant data. 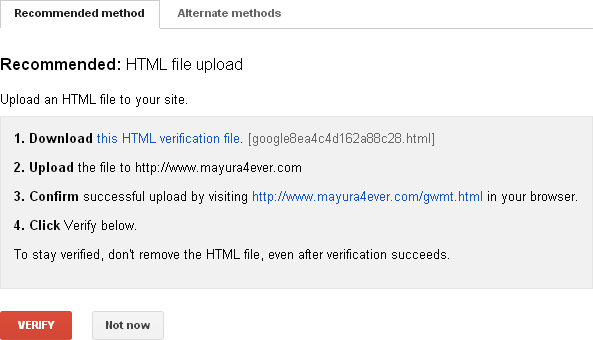 * If you have added www (www.mayura4ever.com) or non-www (mayura4ever.com) version of your blog or website, make sure to add other version (www or non-www) in Google Webmaster Tools too. Ah...I knew that one Mayura! Your tip in the end is so very useful and much needed about adding the www or non-www - whatever you add once is what will work and no other. I again didn't know this till I tried out a few times to see the difference. This is a wonderful tutorial Mayura! I just went through the steps and viola I was able to see my stats...the funny thing is it's not jiving with what my provider's stats show, not off my much but there is a difference...what do you think is the reason for this? Hello Mayura, I have been using this for some time now my friend it's a great tools to be listed in. It's great to monitor the performance of your website or blog. Thanks for sharing this help tips. Ha ha... You might be thinking you are not tech savvy but there's a tech savvy part in you too ;) You are indeed a learner and apply instead of ignoring. This post is just very simple one as few folks had no idea what is Google Webmaster Tools Harleena :) Having www and non-www version is important to as if we come across critical crawling errors or malware problem, we can find more information about it. Glad to hear you have made it dear :) That's cool. You have nothing to worry about trying it, so I was thinking about not explaining all the stuff in one post and giving some room to explore too. That's wonderful :) Now you get started and will look into stuff available there sooner. Well, it's to show how well your site doing on Google search dear :) It's the best place we can find accurate information related to Google and they are not available for 3rd party providers, but only to site owners. So it's possible to see difference between both. Keep up with both stats but Google Webmaster Tools is where you should refer when it comes to Google search impact on your blog. wonderful article to learn how to use Google webmaster tool but I wanna know it is same process to use Google webmaster tool for blogger. You don't need to add your blog to GWMT manually if you are on Blogger dear. As I've mentioned in the post, you just need to log in with your Google account that use for Blogger and voila, you will see your blog listed there automatically. Great share from the University! I think this is really helpful to everyone and especially to one's who are starting fresh and are unaware of the crawling and indexing fundamentals. Thanks a lot for this great share. Your university rocks. I've been using Google webmaster for awhile, and it's good tool to keep track on our website how it's performing in SERP's, even we can do lots of maintenance work using webmaster tool like sitemap, robots file, crawling, broken link, and sitelinks. Another great step-by-step guide Mayura that I know a lot of people will find helpful. This freaks some people out and they have no idea they even need to do this. Now the only issue I've ever run across is I have to upload the file to my server in order for it to verify. For some reason the alternative options never work. It's so much easier to upload the file anyway but when I'm doing this for others I don't have access to their server. Great job Mayura and I hope everyone who doesn't have this in place will. This was great! I went to Google did the site: with my address and found out so much information. Then I tried to do the second part, but I screwed it up. I was rushing it. So I will do it again because I find that this is a great way for Google to see who I am. I must say the video you put in this post was so helpful. I had an obscure understanding of how Google works, but seeing the visual gave me better knowledge of it. I loved it except for the spiders that made me itch he he. Once again, Many thanks my friend. Google webmaster tools rock big time. I use it to scan for site problems and some keyword research. Maybe a little tip: IF you gor a Microsoft (i.e. hotmail) account laying around somewhere, try BING webmaster tools too. Indeed it's important to add your site to Google Webmaster Tools. One thing that I was thinking about again today for the zillion times, is why my personal development blog won't show under my name. When I type my first and last name my writing blog comes first and soon after my travel blog, but for the life of me I can't make my personal development blog show no matter what I do. It' not even on the three first pages at all. I was wondering if you might know what the problem may be. Thanks for another instructive post. Thnx for Sharing Such usefull information, Nice tool to know the performance of your sites and keep updated. i personally used google webmaster and google analytics. oh wow that's really amazing. Absolutely dear :) You got it. This is much focused on people who didn't started with GWMT as the next phase is coming along. I hope you already there checking your statistics for your blog too. Free WordPress.com blogs have in-built function to make that process much easier. Glad if it was available on self-hosted sites. Thanks for coming by and adding your experience on verification Adrienne :) I hope it will help anyone thinking about what to select on WordPress. i. 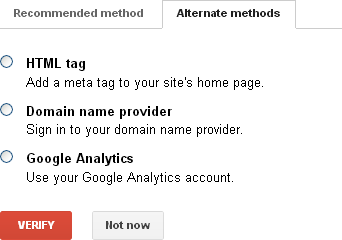 Get your verification meta tag from Alternate methods tab. iii. Jump to Yoast SEO settings at WordPress and add the verification code in Google Webmaster Tools field. I've added screenshot for you to identify easily. That's where it helps a lot mate ;) I use it almost everyday to check errors with mine and explore backlinks too. That's where you find errors regarding to your blogs on Google search dear :) GWMT is MUST have tool if you need to see how Google treats your sites. Well, Google search reveals results according to keywords, but to find authored blogs, you need Google Authorship implemented. * Add all your blog links to Contributor to section instead of Links section in Google+ profile. * Search for Google Plus Authorship plugin in WordPress plugin directory and add to your blogs. Then you just need to enter your Google+ Profile URL and save. However it will take some time for Google to crawl and show your blogs under your name. Woah... So you are already using it :) That's cool. That reveals how your blogs doing in Google search and the tools and information allows you to find what you need to work on too. Another great and useful tutorial Mayura. You are so good at this. I really appreciate it. I will definitely use this step-by-step tutorial and add my blog url to Google Webmaster Tools. Thanks for another great post Mayura. Keep 'em coming my friend. So, I've got my site registered and site map submitted, but that's about it - I don't really understand how to use GWT, so I'll look forward to your forthcoming posts. If you are uncomfortable with above verification options, there's more alternatives available on WordPress :) Let me know if you need to know dear. GWMT let you see how your blog performs on Google. As it's about Google, we can rely on the product of Google, no? :) Of course, it will give more insights and reports if there any errors. I think bit of a tussle is perfectly alright dear :) That's learning in my opinion. I remember when I first stop by on GWMT, I was lost. Sitemap helps Google a lot and make indexing easy Sue :) And I hope you have added both www and non-www version to GWMT too. I'll let you know why it matters in next post :) You don't wanna submit sitemap for other version though. Ha ha... Don't worry Sue :) Believe me, you will enjoy when you get to know what is it all about. No I'm NOT a techie!!!! No idea if I've added www and non-www version and don't know how to check - will await further instructions in your next post, Mayura! Ah... That's easy to figure out. Don't understand - I've just got the non-www version registered - do you mean I add the other version as a separate site? Won't that get me in trouble? And will I have to go through all the same verification palaver (which I can't remember how I did last time around!)? See - told you I wasn't a techie, Mayura - I'm hopeless! Yeah Sue :) Add it as a separate site by following the same steps. lol :D Just on my blog Sue. Isn't it why friends for? ;) Well, helping with what I know. Thanks for sharing the info Mayura. So it's been 2 years already. As we are seeking for help of Google search, GWMT is the access to search data for webmasters. Google has lot of free services and it's one of their strategies on attracting users :) They are in a very good financial position to afford too. AND earn money through the brand image they have built in users.